The CON-TROL-CURE® NEW UV INTENSITY LABELS™ photochromic intensity indicators are a basic, reliable, low cost, simple, in-house method of monitoring UV intensity. 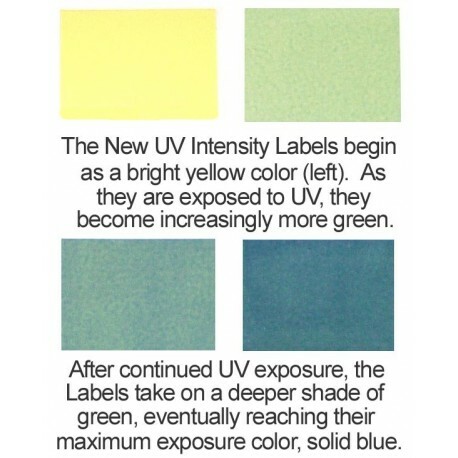 When exposed to UV, the yellow labels undergo a gradual color change from yellow to blue that is directly related to the energy value received. Made from the same exclusive material as the UV FastCheck Strips™, the The UV Intensity Labels™ (N010-005) have the same color changing principle as the Strips, but they have only 1 color changing square. 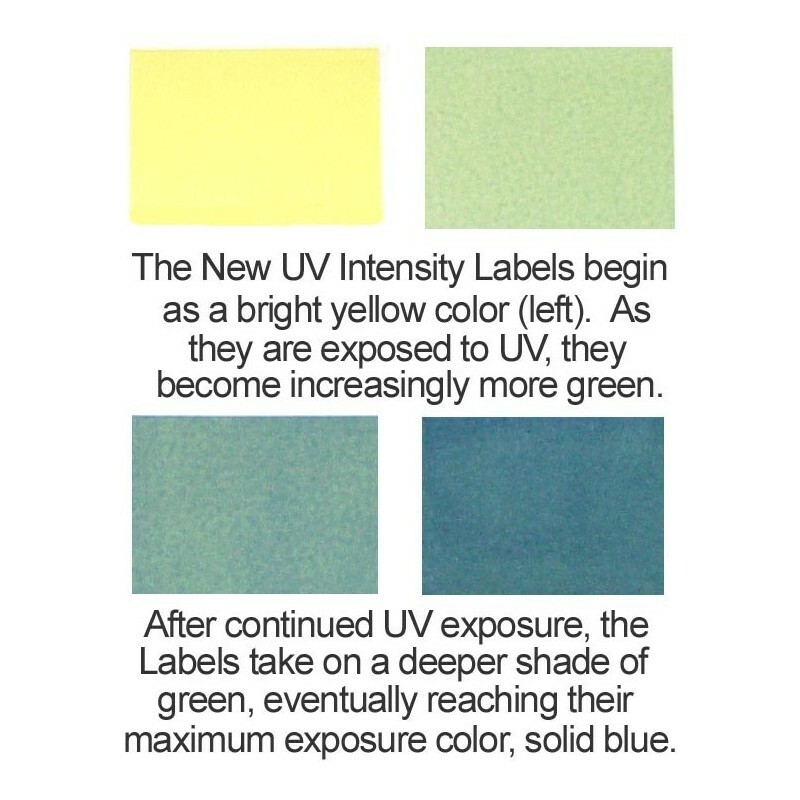 The UV Intensity Labels have a sensitivity range that is 5 times greater than the product they have replaced, the old UV Intensity Labels (N010-001). The UV-C Intensity Labels (N010-004) offer an improved response to the UV-C spectrum, providing a better visual indication for lower power germicidal applications. The adhesive backed label is placed on a sample product or substrate and processed to proper cure rate. The color deviation can easily be measured with a spectrophotometer to record color change or by comparing the colors to test labels created to known operating standards to determine lamp failure or processing inconsistency. NOTE: For best results, observe color change immediately after exposure to UV light as label may change/fade over time. If used on a regular basis, these labels can detect equipment problems at an early enough stage to prevent lengthy shutdowns. Daily tests can easily indicate a step by step calibration for an accurate reference within each batch. The use of a Digital Tachometer can help insure repeatable results in processes where exposure is performed with product in motion. Suggested Use: the CON-TROL-CURE® NEW UV INTENSITY LABELS™ are especially useful in systems where other instruments are not practical, such as 3-D curing, web coating, container printing, medical sterilization, etc. The UV Intensity Labels Dimensions: "H x 1"W (19mm x 25mm). UV-C Intensity Labels Dimensions: 1/2"H x 3/4"W (12mm x 19mm).